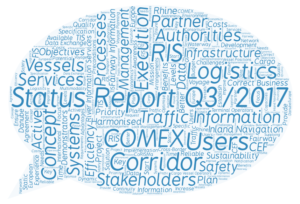 The third quarter of 2017 was focusing on the further elaboration of the detailed definitions of the intended Corridor Services focusing on Fairway Information Services enabling efficient Route Planning, Traffic Information Services supporting Voyage Planning and Traffic Management as well as specific Services to support the logistics transport processes. Parallel the so called Support Services are investigated and defined based on the needs of the Corridor Services. These are more or less background services providing, as single point of access, required information to the Corridor Services. Several workshops of the established Core Teams took place to ensure an efficient discussion and progress: 26th and 27th of July in Vienna, 6th and 7th of September in Vienna, 26th September Rotterdam (Sub-Activity Leader Meeting). Furthermore, in July the draft final first chapters of all Service Definitions were distributed to all partners for a detailed feedback cycle and the specific questions towards the stakeholders related to the individual services were consolidated and provided to the National Project Coordinators to get in contact with their stakeholders to discuss and get answers to these questions. This is considered as very important in order to be able to consider the specific needs and requirements of the users as early as possible, thus already during the service definition phase.